I do not have "fish charisma". Fish do not swim by and leap into my net. And I know this because I have fished with people who do have "the touch". However, if I put in the hours, am very patient, and think positive thoughts so I don't create bad fish karma, I do catch a few fish. 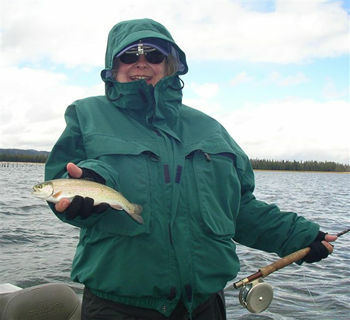 Last year, I fished both Crane Prairie and Wickiup Reservoirs in central Oregon and had good fishing for what, at the time, I thought were large fish. My guide was Brett Dennis. 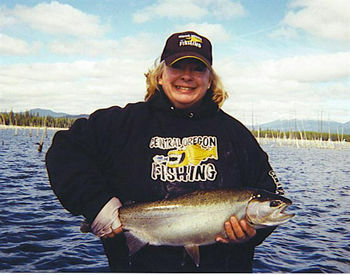 Brett runs the guide service for Deschutes River Outfitters in Bend, Oregon under the name Central Oregon Fishing. Besides being a great guide, Brett has a bass boat that makes fly fishing on lakes a wonder. Those of you with fish charisma will be rewarded. Those like me, will catch great fish, eventually. But you have to be happy with the little fish too. You will note that my smile is just as big for the little guy in the lead photo as in the following pictures. The little guy was caught trolling a #8 green sparkle wooly bugger and the big guy was caught indicator fishing with a #16 black chironomid. I should also add that the big fish was the fifth fish that morning. I broke off the first 3 fish equally big or even bigger before I got the hang of landing these monsters. The fourth fish slipped the hook just at the net and I didn't think I would ever get one into the boat. Then the sun came out, the fish took the nymph, and I remembered to put slack in the line when he jumped. 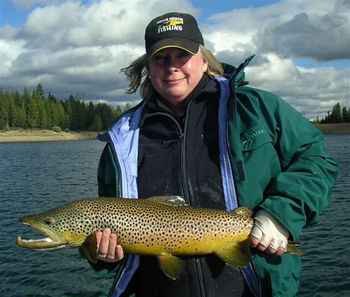 The next sequence shows three browns were caught at Wickiup Reservoir on jerk bait which is almost fly fishing. Jerk bait are 6" plastic fish painted to look like rainbows - totally artificial with no scent or other spin sins. You cast them out (over and over and over again) with spinning rods and then jerk and reel in to imitate crippled, vulnerable, little fish. 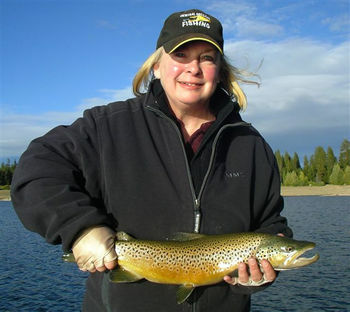 The brown trout frequently follow the little plastic fish all the way up to the boat and then take off which is very frustrating. 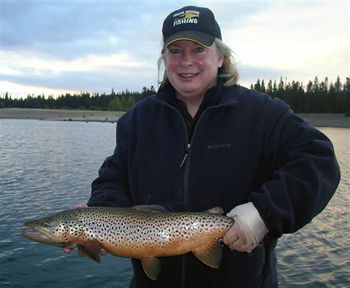 Fortunately, there isn't as much skill in landing brown trout. They don't bother to fight, they just swim off with the bass boat in tow. After awhile, they get a bored and you have a chance at reeling them in.